Note : attempt any ten questions. a. 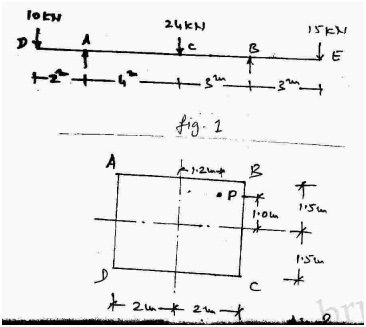 Explain briefly about tensile test on mild steel. b. What is poison ratio? c. Give the relationship between the elastic constants. d. Define normal and shear stresses. f. What do you mean by ‘varying lands’? h. What do you mean by radius of gyration? j. What do you mean by section modulus? k. Give Euler’s formula for columns. l. Define a redundant frame. a. 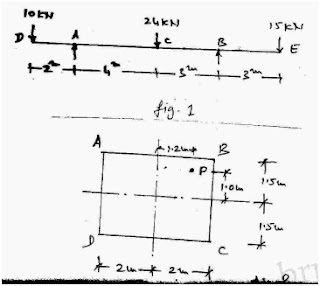 Calculate the second moment of area of a T-section 150x 150x 50mm about horizontal and vertical axes passing through center of gravity of section. b. Calculate the reactions at support A and B or beam loaded as shown in fig. 1 Draw BMD and SFD. Also determine the pints of contra flexor with in span AB and show their positions on BMD. i. The stresses at the comers of the frier. ii. Additional load that should be applied at the center of frier so that there is no tension anywhere on the section. iii. The stresses at four comers with the additional load at center.